Syrian government army units, backed by Russian air power, and pro-US opposition forces are closing in on Raqqa, the de facto ISIS capital, from different directions. 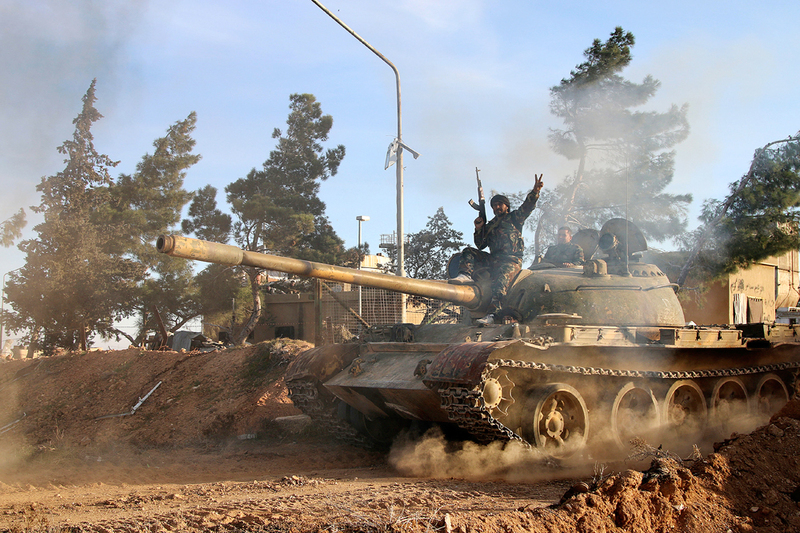 The fight against Islamic State forces in Syria appears to be at a turning point. For the first time since the start of hostilities, two anti-terror coalitions (those led by Russia and those pro-U.S.) have, in effect, joined efforts to liberate Raqqa, the de facto ISIS capital. The advance on Raqqa is coming from two directions: by pro-U.S. opposition units and by Syrian government troops which, until recently, have not conducted any operations in Raqqa Province. To storm the ISIS stronghold, they have dispatched their assault units, which are operating with support of Russian air forces. According to Kommersant sources, Russian military advisers are assisting in developing plans for the offensive. The speed with which the offensive will take place will affect the time-frame for completion of the main phase of the anti-terrorist operation in Syria and neighbouring Iraq. The offensive that the Syrian army mounted last week on approaches to Raqqa was a watershed. Government troops had not set foot in that province since August 2014, and Raqqa was considered to be the Islamic State’s stronghold. The only ones who dared to contest the caliphate’s rule over this land were Kurdish detachments and several opposition units which form part of the Syrian Democratic Forces alliance, enjoying U.S. support. These forces announced in late May that they were starting an offensive against 200,000-strong Raqqa, which had been proclaimed the caliphate’s “capital.” However, that offensive, which came from the north, was not particularly rapid. One of the reasons was the manpower shortage in the united forces of Kurds and the moderate opposition. The operation recently started by the Syrian army and militia units in Raqqa Province may pose a far bigger threat to ISIS. According to the Lebanon-based pan-Arab TV channel Al-Mayadeen, Syrian government forces have crossed the border of the province for the first time in two years, and have seized an important transport hub in the village of Zakia. They are mounting an offensive on the city of Tabqa, together with a nearby military airfield and a dam on the Euphrates. If the government forces manage to capture Tabqa, they will get direct access to Raqqa, which is just 25 miles away. According to Western media reports, the vanguard of the advancing army is made up of elite units known as Desert Falcons. The operation involves armoured vehicles, artillery and aviation. Neither Damascus nor Moscow nor Washington have officially confirmed that the two anti-terrorist coalitions are coordinating their actions in Raqqa Province. However, military experts commenting on the situation on June 5, and reported by Western and Arab media, consider it to be very likely. Russian military sources polled by Kommersant say that the Russian air force is rendering serious support to the Syrian government troops on their advance to Raqqa. According to a Kommersant source, Russian front-line aviation support allowed government troops to advance deep inside the province and gain access to the road leading to Tabqa. “Targets are chosen on the basis of space reconnaissance and covert intelligence, while the Syrian army’s actions are coordinated with our military advisers,” the source said. “We have established contact with the U.S.-led coalition, but there is no joint operation planning on the cards. We have proposed it, but the U.S. does not want to have full-fledged cooperation with us,” said the source. The offensive on ISIS positions around Raqqa will largely determine the future of the fight against Islamist terrorists and the time-frame for completion of the main phase of the anti-terrorist operations both in Syria and neighbouring Iraq. If – under the onslaught of the united forces of both coalitions – Raqqa falls relatively soon (in the course of several weeks), it will definitely have an effect on operations in Iraq, where government troops are storming Fallujah with U.S. support and are preparing to mount an offensive on another ISIS stronghold, Mosul. On the Syrian front, Raqqa’s fall could become the coup de grace for ISIS. It is the last large city that the group still holds in Syria.